We did gourmet for sure last night. We made burgers topped with brie and truffle aioli. I made the buns, I packed the burgers, Thomas hand-cut the fries. And it was awesome. We picked up the book Burgers by Paul Gayler last weekend and I think we're going to be making a lot from in there. Burgers is packed full of awesome gourmet burger ideas and not just with beef. There's salmon burgers, lamb, vegetarian and turkey burgers. Plus tons more. And even if you don't follow the recipe exactly this book is loaded with unique toppings and tasty inspiration. The Niçoise Crab Burger might just be next on my list! I highly recommend this book to anyone, because who doesn't love a good burger?? I certainly do! I had to run a few errands after work yesterday so I stopped by Pelly's Fish Market in Carlsbad for something different. I love Pelly's but it's not on my usual route so I don't make it there very often. The scallops were huge so I bought them as a special treat for Thomas. I brought them home and proceeded to sit on the stool at the counter while Thomas cooked away. 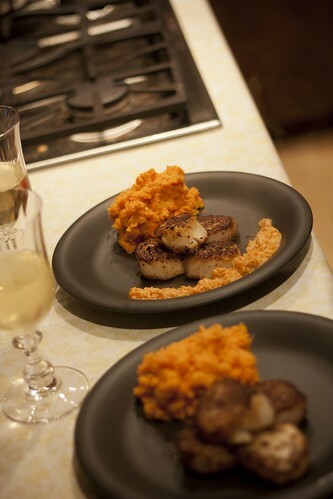 How did I get lucky enough to find someone to make me porchini crusted scallops with a roasted red pepper sauce and a side of sweet potatoes on a monday night? Yeah, baby! Score one for Heather.